If you somehow managed to survive the next global catastrophe, long predicted by various prophets, and unfortunately were not among elite inhabitants of cozy underground refuge shelters, but absolutely alone among the ashes and ruins of our civilization, you will be faced with a set of unusual problems. We assume that you will manage to find an elementary hiding place for yourself and provide livelihood for a few of months (basic survival will not be the focus of this article). However, sooner or later you will start asking yourself the question, “Did somebody else survive as well?” After the apocalypse, nobody will have an opportunity to use a mobile phone. Electricity will not be produced any more, and the energy stock in accumulators will be depleted in a matter of days. The mobile phones can be kept as a souvenir. You will not hear anything on FM radio. The silence will come. The Internet will not survive. Radio - is the most reliable and simple way of communication (except trained carrier pigeons). It is not important whose voice is on the air; it is good, if it will be an intelligent crash of someone's spark-gap radio transmitter, instead of electrical noise of the coming nearby thunder-storm! Taking into consideration the way radio waves travel, it is possible to estimate how far a human being who is using a radio transmitter is located. Hopefully, it could be the call signal of a radio beacon from an underground refuge shelter. Why build a radio receiver? We have assumed that you would somehow solve the hunger and cold problem, but aside from darkness and the usual hunger, humans have one more enemy - information hunger. A human being cannot live without talking to others, he needs to communicate with someone, engage in dialogue. Under conditions of total absence of such communication, the human goes mad and perishes. What would you undertake in search for information? I am not talking about sports, news or advertising - it is a far more serious question that the information we are generally used to. You have your mobile phone, but how would it work with broken down masts of aerials or electricity? No miracle will help you find an operating TV. There is no electricity to supply your TV and the television studios’ equipment. But what about a GPS navigator? Same thing. It will not show your co-ordinates without operational terrestrial updating stations. We have to come back more deeply to the roots of communication - radio. An old type of a broadcasting medium about which many of us have forgotten is capable to transmit information over long distances. It is most likely that through the radio, not a mobile phone, or TV that people will try to declare their existence. The radio receiver now becomes a necessity. 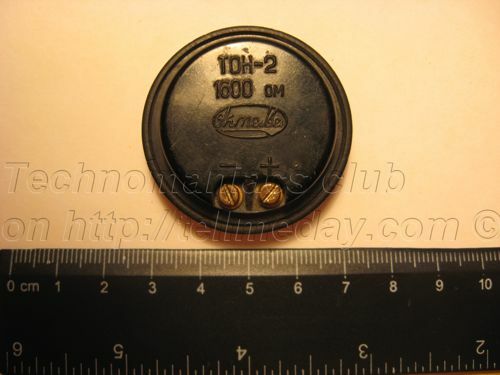 Try to search for portable radio receivers that work on batteries, such as ones you might find in many abandoned cars. If there is no radio set in the car, a working battery will be very useful to you. Collect and store automobile batteries, even if they are not working. There are many elements in them which can be used for constructing a hand-made radio receiver or a radio transmitter. If you find a working receiver and provide a power supply, you should be very happy. It’s better if it is multi-band receiver, capable to receive long waves (LW), middle waves (MW), short waves (SW) and ultra-short waves (VHF). An important thing you need to know is that on different bands you can receive a signal of a radio transmitter located a certain distance from you. For example, VHF can receive a radio station signal from a distance less than 30 kilometers. A signal of long and middle waves can be received from a distance up to several thousand kilometers at night. Using a short wave band, you can receive a signal from a point on the opposite side of the globe. Let's assume that you already have a receiver, and you try to find a broadcast. But remember that batteries cannot work for a very long time. Checking broadcast is important, but don’t do it for too long. When you figure that the batteries have started to discharge, take them out of the receiver. Try to prolong the batteries’ life. For this purpose, they can be slightly pressed by stone or you can simply bite them with your teeth, but do it very accurately to avoid breaking the graphite core. If this happens, the batteries should be thrown out. After about a week or two your radio receiver will become silent because of the discharged batteries and you will not hear any stations. You can make an effort to restore the batteries to working condition for a short time only. Some techniques exist for doing so, but you will not be able to do repeat them a second time, and as the result you will eventually not have any available source of electricity. How can you receive broadcasting when there are neither wired power supplies nor batteries? Easily!!! Build a radio receiver with your own hands that does not need a power supply!!! Now you understand that we wish to train you about how to make a radio set from improvised materials. Probably for most of you, it is necessary to go way back to history of the evolution of modern communications: radio and TV, mobile communication and the Internet, modern GPS navigation and other gadgets which are now an essential part of modern life. I will try to carry out an unprecedented effort - to fit five years worth of high school technical courses within the framework of given article in simple and clear instructions. It is not a secret that, even though each inhabitant of our planet is spoiled by modern civilization, has at least once appeared in a situation of absolute feebleness when for whatever reason the electricity in their house was disconnected. Remember, how you convulsively searched for a lantern, then a lighter, and then matches. Each time you promised yourself that will buy a small lamp on duty, a candle, and a match, and they will always lie in a place accessible to you. Observe, on what great acts short absence of electricity can induce your brain to be inventive in such situations. I am sure that during a month of such darkness you will be able to start a fire masterfully by stick friction! 2. How to survive in extreme conditions having learned this skill. In other words – watch and learn, because this knowledge can one day save your life! Proceeding from these requirements, we define the subject of our creation - the crystal radio set. Yes, such receiver, the simplest and cheapest to produce, does not demand any additional sources of electric power for work. It is so amazingly simple that you can create it without any special knowledge of radio and mechanical engineering! One thing to note: it is difficult to exactly allocate the source of a signal if there are two or more powerful stations transmitting not far from an installation site of the crystal radio set. This is favorable to us since we are trying to receive any available transmissions. The crystal radio does not require lamps or transistors and is always ready to work. There is a great number of schemes for the crystal radio, all differing in complexity, ways of adjustment, and various degrees of selectivity. However, there are a number of disadvantages, which are impossible to eliminate in the detector receiver. The detector receiver does not provide reception of distant radio stations. The most powerful radio stations are audible on the detector receiver not further than at a distance of 600 - 800 km in the afternoon, and only in the presence of very high reception antenna. I will try to highlight the principles of radio reception in such manner that your future design will not remain a secret black box for you till the end of your life. The alternating current quickly changes direction and power moves from a radio transmitter to an antenna. You should recall this from your physics courses in High school. Due to the influence of flowing alternating current, the electromagnetic waves are being produced in surrounding antenna space, and the radio-waves radiate into space. 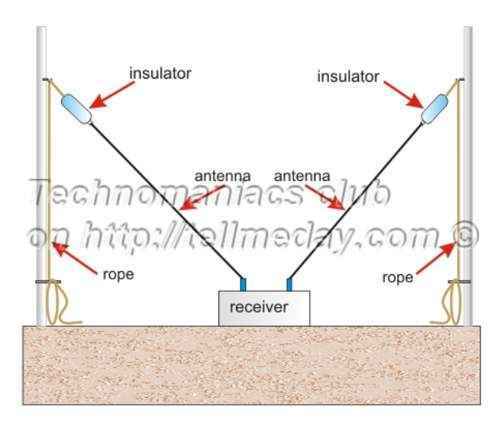 These radio-waves extend from the antenna of transferring radio station extensively with a velocity of light, i.e. 300,000 km per second. Let’s assume that an announcer speaks in front of the microphone connected to the transferring radio station. The microphone is connected to the transmitter in such a manner that sound fluctuations of speech influencing this microphone are controlling the power of radio-waves radiated by the antenna. Part of the waves radiated by the antenna of a radio transmitter radio-waves reaches the antenna of our receiver and excites in it the same alternating current which takes place and in the transmitter aerial. Of course, this induced current will be immeasurably less in power than the current in the transferring aerial, but will be changing in time to a voice of the person in front of the microphone at the transferring radio station. 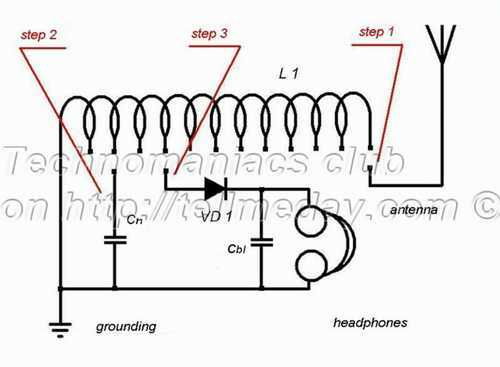 The induced currents arriving from the reception antenna of the crystal radio transform into currents capable of directly influencing headphones. This mission of transforming the currents is carried out by the receiver detector. Any reception antenna, even the small room antenna is crossed by radio-waves of enormous quantity of the radio stations scattered all over the globe. The aim of any receiver - to allocate only that radio station currents which you wish to listen at present from this enormous number of currents induced in the antenna. You do it literally "adjusting" the receiver by rotating of the handle of adjustment of the radio receiver. Tune it on specific radio station sometimes located on enormous distance from a place of reception. It is quite clear that in our case you can accept confidently only very powerful enough radio stations located not too far from you. 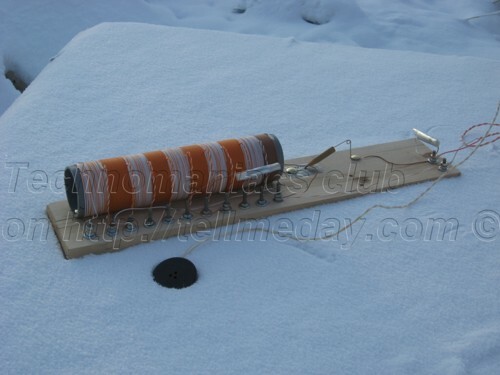 The crystal radio is very simple device. Any crystal radio set has an oscillatory contour which helps to adjust the receiver for a wave from desirable station. The reception antenna and grounding are joined to an oscillatory contour. In some radios the communication between antenna and oscillatory contour is carried out through the capacitor of small capacity with the same purpose. The electric fluctuations of high frequency accepted by the antenna are allocated with an oscillatory contour in the event that it is adjusted on their frequency, and are eliminated - if it is not adjusted. In accordance to which contour is adjusted the specific radio station transfer is separated and allocated from all the others. The detector chain made of the consequently joined detector and phone connected with a reception oscillatory contour. The high-frequency electric fluctuations accepted and allocated with a reception contour, branch off into detector chain where they are detected, turning to fluctuations of low (sound) frequencies. Currents of sound frequencies, passing through a phone, force to fluctuate its membrane, which reproduces a sound. For the best work of the receiver so-called blocking condenser joins in parallel (Cbl) to the phone (Fig 1). To define necessary details and materials, it is enough to look at the scheme of our receiver. I have mentioned above that most likely the majority of required details will be inaccessible. Don’t worry, they can be created by your hands, without special equipment and machine tools. Let's look once again at the scheme (a Fig. 1) from top to down and list all elements of our radio receiver. First of them - antenna, further the coil of an oscillatory contour, some condensers of an oscillatory contour, the detector, the blocking condenser, a headphone, and grounding. Not a big deal if there is shop of radio components nearby your house. But let's imagine worst case scenario when there are no any shops. I will describe each element from this set, and which material you can use for handmade manufacturing. Antenna is a long wire from 30 to 100 meters in length. And as it is a wire it can be an integral piece of such long wire, or consist from pieces of various wires braided together. It is not so important from what type of metal, whether it be aluminum, copper, steel or other. Take everything that you can find. The important thing is that totally they must represent required length and connected among themselves reliably, avoiding damages at tension points. While connecting separate pieces of a wire, do not forget to clear it from oxides, rust and paint. Another important notice. It is necessary to mount the antenna somehow to a high object. But it must be done through an insulator which you can make by yourself. The antenna will not work properly without an insulator, especially in crude weather, during rain or fog. An insulator can be made of usual plastic bottle. Thus, use wires for the antenna, and plastic bottle for antenna insulator. The coil of an oscillatory contour (L1) is a resonant element of the receiver, a set of many winds of a wire on a rack. Wires required for it, but no any kinds of wires. The wire of small diameter approximately 0.3 - 0.8 mm is good match and the amount you need must be enough to reel up not less than 100 winds on a rack, for example, on 50 mm of a plastic pipe from water drain system. 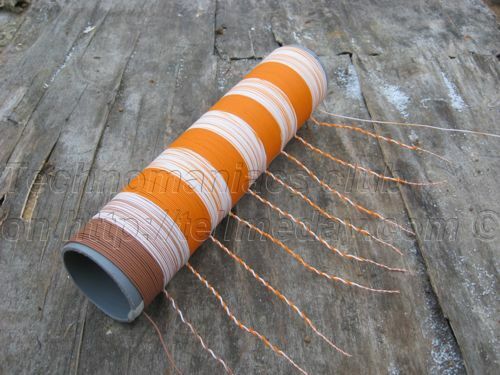 If there is not enough integral wire for the coil it is possible to compose it from pieces. So, for the coil of an oscillatory contour you need a wire and plastic skeleton in diameter about 50 mm. Capacitor of an oscillatory contour (Сn) – is a resonant element of the receiver, serves for receiver adjustment. It is necessary to make a couple of them various capacity. It is not difficult to manufacture these items. A foil (from sweets, chocolate, etc. 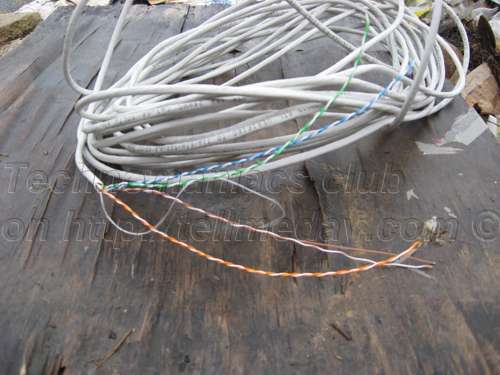 ), polyethylene and small pieces of wire for installation are required. The detector (VD1) - in our case is an element which allocates a modulating signal (a voice of the announcer, for example) from an accepted radio signal. This detail is not more difficult to manufacture then others. Is better to use the diode of factory manufacturing, at worst it can be made by you. The blocking capacitor (Сbl) - restores losses of the demodulated signal. With it the receiver works aloud more loudly. It can be manufactured in the same way as adjustment capacitor. The materials for its manufacturing are absolutely the same. Grounding is second half of the antenna, and it means that badly collected grounding will worsen the quality of the accepted signal. It is possible to use pipes of water systems as ready-made grounding if they have good contact to the ground somewhere along extent. If such conditions are not presented, you need to make them. Dig a hole in the ground and bury in a massive metal subject, which have a wire stick out of the ground. Headphone - is a door into invisible world of radio signals, it is like some human consciousness interface :). To make it is almost impossible. I mean, to make a headphone with such characteristics what are necessary to us. All secret of headphone for us that it high-resistance. Its internal resistance should not be less than 1600 Ohm. The structure of its design includes a magnet, a metal membrane and very thin wire. It is extremely hard to assemble it manually! Therefore it is necessary to search it. If you can’t fin such headphone, use alternative variants. You will find those details in the second part of this article, everything about what alternative accessible details can be used instead of a high-resistance dynamic headphone. As I have already stressed, you can use any strong wires from any metal for the antenna, as long as they are of an appropriate length. The details about the exact length I describe later in this article. You can grab any kind of a material for manufacturing the antenna there is no any special requirements - it is necessary to take all that will fit the goal. It can be fragments of electroconducting of buildings, telephone lines, any assembly conductors, coaxial television cables, trolleybus and tram lines. But last of them is heavy enough both for installation, and for carrying over when defining a direction to a signal source. The insulator should be built from any dielectric. I have suggested to use empty plastic bottle. It is unimportant what was in the bottle before. If you can't find a bottle, it is possible to use a plastic pipe, any plastic subject. Use anything what you can find to provide reliable isolation of an antenna wire from a subject to which the antenna will be fasten. Again wires with the diameter from 0.3 to 0.8 mm are required. Wires can be in varnish, silk, plastic isolation - it does not interfere with coil work. It is better if the wire for the coil is integral but if is not possible to find such elongated wire it is possible to use pieces of conductors composing contour. Power wires from electroconducting do not fit - they have too big diameter. When searching it is necessary to pay attention to transformers, lines of computer networks, telephone lines - there can be found what is necessary to us. If you can not find a good wire for the coil or installation of details, use a wire from transformers (Fig. 4). Probably, you saw in the childhood the scattered metal plates in the form of letter E. Transformator should be assorted accurately in order not to damage a wire. The best tool for transformer dismantling - a screw-driver. 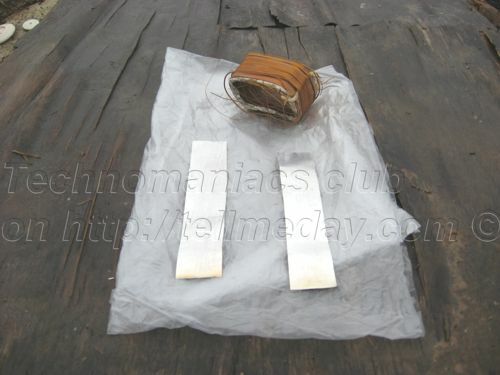 At first it is necessary to remove metal stuff which fastens transformer plates with a skeleton. Plates should be removed, they are no use or us. When you reach a skeleton, remove from it a protective film. Then start to wind off a wire. Avoid formation of knots of a wire. Reel up a wire on prepared bulk. It is better to use any material for a bulk in diameter from 3 sm and above. It is recommended to fasten threads to avoid unwound of the wires. Now some words about a coil skeleton. 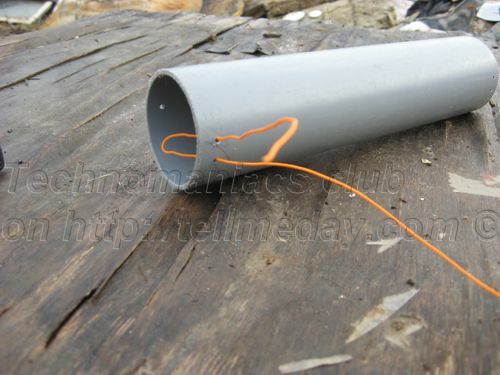 I recommend to use a plastic pipe in diameter of 5 sm which can be found on ruins of water systems. But it is possible to reel up the coil also on any tubular skeleton from insulator material in diameter about 5 sm, for example, on a glass bottle, a plastic bottle if only this bottle has not the figured form, i.e. had constant diameter all along the body. For manufacturing of these details foil and material which serves insulator function between condenser facings are required. It is possible to take a foil from wrappers of chocolate, sweets, a metallic wrapper of an other foodstuff. Such foil is flexible enough and is very suitable for us. The polyethylene packages, packing material, dry writing paper, waxed paper can play the role of dielectric. Newspapers and magazines will not work, as their dielectric properties will be hindered by the typographical paint that is used in the print. Lucky you are, if you find a semi-conductor diode among radio engineering stuff (Fig. 5). It will relieve you from difficult work on manufacturing of the detector and save your time. Your receiver will work more loudly with factory diode, than with self-made. Of course, semi-conductor diodes do not roll scatterings in streets. They can be found in broken radio receivers, tape recorders, TVs. Attentively study the contents of electronic devices as diodes have the small sizes from 2 to 4 mm at length. The semi-conductor element, as a rule, is concluded in the glass case. The case has strips. In our case the quantity and coloring of these strips have no meaning. Which orientation to mount the diode in the scheme of our receiver is not important. 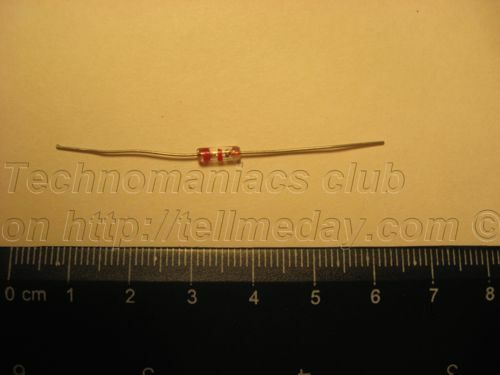 But if you can't find such diode, no worries - it can be made by your hand. The essence of our article is to provide you with knowledge how to make necessary components of the receiver. The design of the self-made detector will be discussed in other part of article. I give you a hint that you should find a simple pencil, a razor edge, a pin, a little small nails, a plate for design fastening. Small nails can be extracted from window wooden frames, footwear. If don't have suitable grounding (a site of water system, for example) in an installation site of a radio receiver, it will be necessary to find a large metal item and manufacture grounding by hands. It is better, if this thing is not painted, so reliable interaction with soil thereby will be provided. It will be possible to use a metal bucket, the refrigerator case, a metal cooker, a tractor, the tank, the ship as grounding. Do not forget to peel the paint or enamel in connection spot. I have to repeat that it is almost impossible to make a headphone by yourself. Therefore you have to search ready headphone for your radio receiver. Targeting to ear-phones among household stuff has no sense. The low-impedance ear-phones do not suit for our design. Thus, tiny ear-phones for players, pocket receivers do not suit either. They have internal resistivity only from 16 to 32 Ohm. Even headphones from house audio-systems as do not suit us - they are the same type of dynamics, with internal resistance 8 Ohm, accordingly. Usual dynamics do not suit because of the small resistance. And regardless how good is assembled your radio receiver, with all these ear-phones and dynamics which I have listed you will hear nothing. Finding exact thing for that is necessary for us. Pay attention to receivers of city automatic machines, home telephones, on-door speakerphones. On the back side of an ear-phone the manufacturer usually specifies size of internal resistivity. What suites us - with resistivity of 1000 Ohm and above. Even if there is no specification on such devices - take them, occasionally they may fit requirements. There is no sense to connect ear-phones consistently for summation of resistance. But how to make sure that whether certain device (ear-phone) is serving good for us or not, with silence in the air? What if it is already faulty? Very simple. You should hear loud enough click at the moment of connecting antenna or grounding to the receiver. It is clicking because of the accumulated static pressure in the antenna chain. The more resistance has an ear-phone, the louder will be a click. Do not expect to hear a habitual noise with frequency 50 Hz which is usually causing by electro-conducting lines - there are no operational electro-conducting lines around you! We have all necessary stuff for assembling: a razor blade, a block of wood, a simple (graphite) pencil and a pin. The essence of this design is the connection spot of the razor blade and the graphite slate of a pencil which forms semi-conductor transition. For rigidity of the design it is necessary to fix the razor blade on a small wooden plate with a nail. It is necessary to think ahead how this razor blade and connecting wire will be fasten. I recommend to fix a razor blade and a conductor on a plate with the same nail. We make a second part of the detector from a pin, a small slice of a simple pencil and a nail. It is necessary to wet a pencil. The hardness of a slate pencil at the initial stage is not important. The length of a pencil should not be big, only 2 - 5 centimeters. It is necessary to stick the pin between the pencil graphite and the surrounding wood, in order to provide reliable contact. 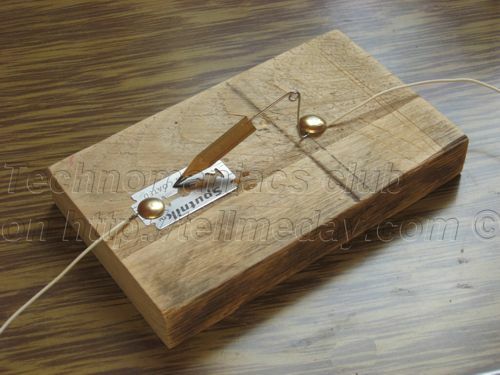 The other end of the pin must be attached to a plate by a nail. The final design looks approximately as shown down below (Fig. 7). The most important thing here is to find the point of the best sensitivity moving the pencil graphite edge over the surface of the blade, regulating pressure on a pencil, and finally stick the blade with a pin. I recommend to manufacture several detectors using different types of razor blades and pencils with different hardness of graphite. It is possible to use both types of razor blades: rusty ones and brand new. Sometimes it will be required to scratch the contact area of the blades. I hope you will be proud with what you made. It is better to make the coil of an oscillatory contour for middle-wave and a long-wave range without any ferromagnetic core. I recommend to apply a rigid skeleton, for example a piece of polychlorvinyl pipe in a diameter of 5 centimeters. Of course the creator can also use a cardboard pipe, but a cardboard can easily be damaged in wet conditions so try to keep the cardboard dry. The wire is required in a diameter no more than 1 mm, it will be better if you find a wire in a diameter about 0.3 mm. You will be very lucky if you find a network cable used for connection of computers in a network. Those can be easily found in office premises under a ceiling hidden behind a covering. In the network cable are eight thin wires. Imagine, the piece of a network cable in length of 10 meters will give you the 80 meters of so necessary assembly wire which will fit practically for any device, including for the coil. We will make two holes in which the wire can pass through. Holes are necessary for fastening wires, but it is possible to fix the wires by a piece of duct tape if you have it. The total amount of wraps which will be necessary to lay accurately wrap to wrap without a cross will be no less than 100. The more, the better - the wider range of radio bands you can capture. After each 20th wrap I recommend to make an eyelet - taps to which we will connect the antenna, the detector, capacitors in search of a signal. It is necessary to clean each eyelet ending from coating. Using simple formula L=2пR we can define the total length of a wire for our coil: for 15.7 sm - one wrap, then on 100 winds - 15,7 meters of a wire, for 200 wraps - not less than 32 meters (taking into account taps is required). It will be very good if you find a network cable that is at least 4 meters (Fig. 9). I have found recently 13 meters of a network cable - it is 104 meters of wire! The total length of wire required for winding will be approximately: diameter of a wire with isolation * quantity of winds, about 1.1*100=110 mm for 100 winds or 1.1*200=220 mm for 200 winds. Consider it, when cutting off a pipe. So, the coil (the Fig. 9) is almost ready, don't forget to clean eyelets which we have made (after each 20th wrap) from coating. It is possible to do it, slightly singing endings of eyelets, but most important thing here - not to overdo and not to spoil all work. It is better to fasten taps for reliability of the design. The coil can be fixed on a plate, but it is not mandatory. Its position on a plate does not influence work of our receiver. Each part from the antenna to grounding is important in this receiver! Antenna fastening must be qualitative to provide radio functionality. It must be fasten through an insulator. Moisture, dampness, snow affects dramatically properties of the antenna, therefore it is necessary to try to reduce these influences to a minimum - that is why an insulator is necessary. Actually it must be made of qualitative material. The wooden stuffs will not work for these purposes as it quickly becomes wet. 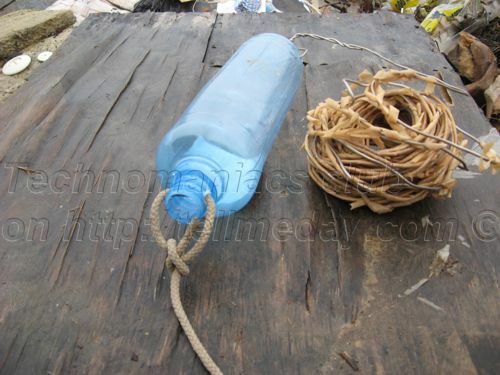 The most simple and most accessible way to make insulators from the necks of glass or plastic bottles. I recommend to use a usual plastic bottle (Fig. 2) for a reliable self-made insulator of the aerial. Make two holes in its neck and two at the bottom of a bottle. The neck and the bottle bottom, usually are more rigid. Use two holes in the neck to fasten a wire of the antenna and two others on the other side for the rope fastening it to a mast (to a column, a tree, any high subject). It is possible to throw one end of a rope by means of cargo on a tree, and then to tighten upwards the antenna. Such insulator will be reliable enough to hold long antenna and it is important to stress, that the longer and thicker is the wire the stronger will be a tension on the insulator. Capacitors as well as coils is possible to make by own hands. It is the most easiest part to make a capacitor with constant capacity. 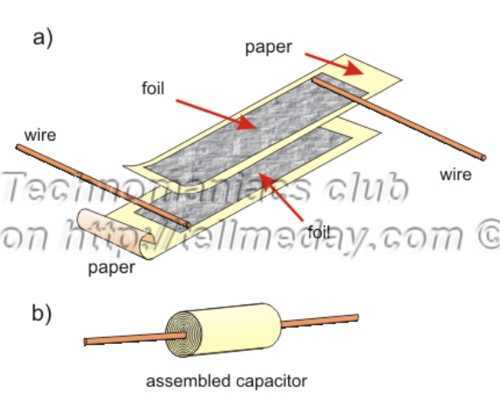 For self-made capacitors in capacity to several hundreds picofarads following things required: the aluminum or tin foil, thin writing or a tissue paper, packing polyethylene. You can find considerable stocks of a foil in ruins of houses from ovens of gas or electric plates. Also it is possible to take a foil from the spoilt paper high-capacity capacitors or it is possible to use an aluminum foil from chocolate wrapping. It is also possible to use the oiled paper as quality dielectric from damaged condensers. Look at the general scheme of the capacitor (a Fig. 10b). As for the manufacturing process (a Fig. 10a) it will be described in second part. We will use capacitors in oscillatory contour. Is better to make about 7 different capacitors. I recommend to make the smallest capacity of 100 picofarads and so on to 700 picofarads. We will try to connect them to the coil one after another, thereby carrying out adjusting on a band. Another one condenser - blocking. It is connected in parallel to a headphone, its capacity must be about 3000 picofarads. The recommended length of the antenna makes the fourth part of length of a wave, i.e. from 37.5 meters to 150 meters. That means it will be necessary to make an antenna from wire slices, but total length must be from 37 to 150 meters. I recommend to take average size about 90 meters. But in case of less then 37 meters the antenna will not work properly and you will notice it, trust me. Any cables and taps from the antenna to the receiver are not required, the antenna should be directly connected to the receiver - it will simplify our design. The second end of the antenna should be attached to an insulator about which I have already told and as high as possible. Much higher! Better if it you manage to hang it not even to a high tree, but a high building. Do not bolt the antenna to unfamiliar wires! It may be wired to a high voltage source, and then you risk the life. 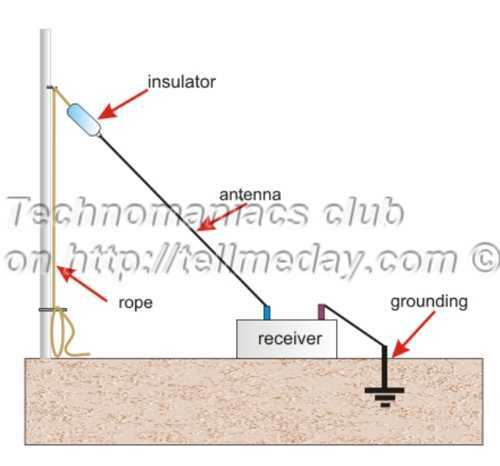 Grounding is second half of antenna and it is very important too. It is better, if you find metal pipe which is sticking out of the ground. As an alternative variant use heating metal battery or a pipeline of water system, piece of armature. The most important thing in this design to provide reliable contact to the ground, and the more surface is contacting the ground the better. It is possible to build own grounding. In that case, the ground must be humid enough. It is necessary to dig a hole more deeply, to pour in with water, to throw there an iron bed or metal bucket or any massive metal object, preliminary having attached to it a wire sufficiently long to connect it to the receiver. Cover the hole and pour with water for reliability (not for growing a bed) and best contact. If water is not presented, then I recommend properly rumple the ground. So, our radio set is ready, the aerial is fixed on a tree or whatsoever, grounding is driven in a ground, and we can start listening radio signals.